While Daumier's star has risen in the art world since his death, he was well known during his lifetime for his sometimes grotesque and other-worldly caricatures of French politicians and other fellow countrymen. 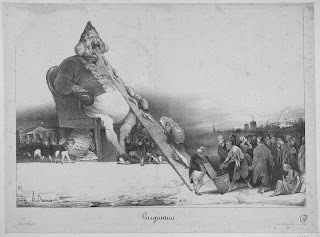 In fact, he was once thrown in jail for a controversial cartoon entitled “Gargantua.”(3) One example of his tongue-in-cheek portraiture is a lithograph depicting Agricol Perdiguier (1805-1875) -- a French socialist politician and a Deputy after the 1848 revolution -- who was forced into exile following the rise of Napoleon the Third in 1851. 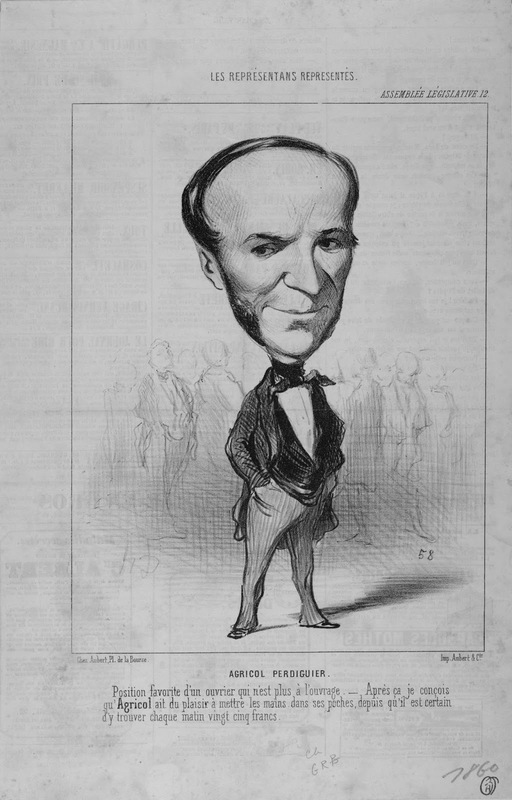 The caricature lampoons the salary of 25 francs the Deputy received, which was outrageous for the day. 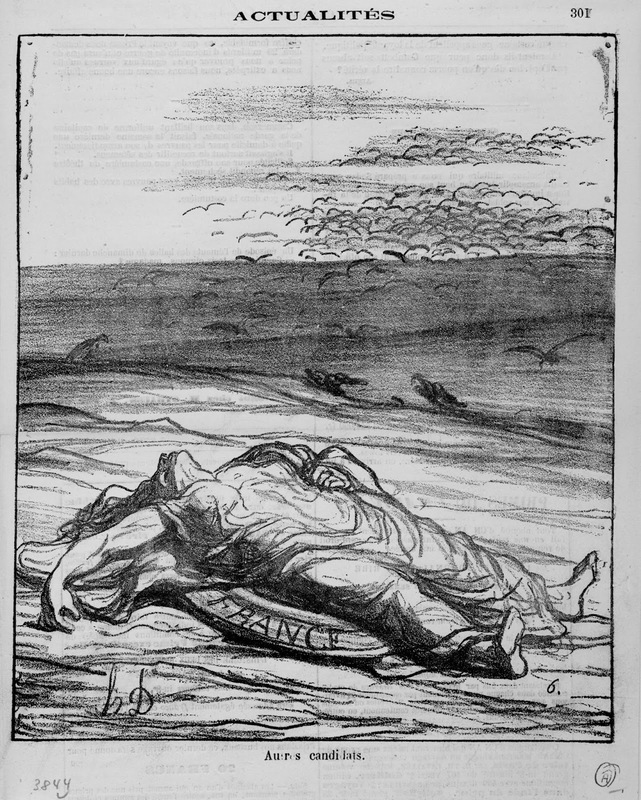 Perhaps one of Daumier’s most moving and most scathing pieces is an 1871 work captioned (translated from the French) “Other Candidates,” wherein political candidates come in to scavenge on the carcass of a woman, labelled “France.” Such seriousness is present in many of Daumier’s drawings, paintings, and lithographs and exemplifies his more overtly political work. 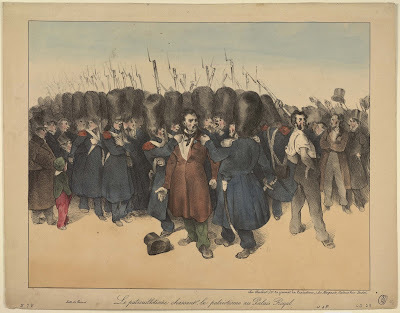 Daumier did not, however, maintain a serious façade at all times, and there are examples of his lithographs being employed for less political ends. In amongst artwork lampooning French economy and politics, there are lithographs of polkas and poodles. One such piece, “Une Terrible Rencontre,” is a cartoon of an urban family encountering a frog on a walk in the country, the husband shielding his wife and child as though confronted by a monster. While not explicitly political, the image does gently rib the city dwellers of Paris for their increasing alienation from nature as the Industrial Revolution’s engines begin to turn. The simple image conveys a strong message about the strained relation between nature and the city dweller. 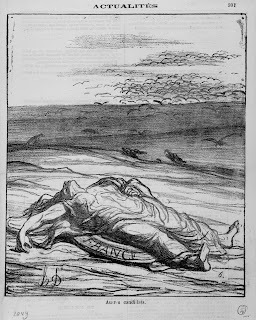 Alongside Daumier’s cartoons and caricatures stand some of the advertisements he created, including one for Le Charivari (a French illustrated magazine to which Daumier contributed), attempting to draw in new subscribers. 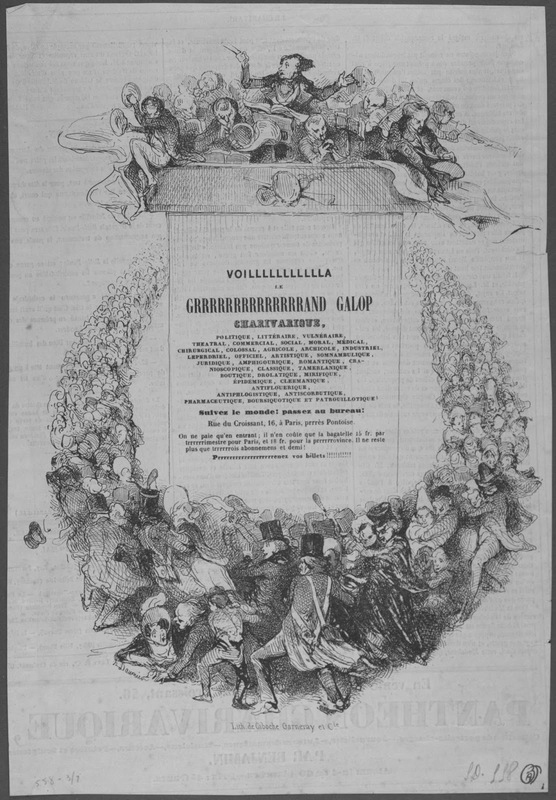 The ad is not without Daumier’s token humor, as the title’s letters are repeated in caption, in all capitals, as though one is being shouted at through the image (“VOILLLLLLLLLA! GRRRRRRAND GALOP…”). The value and appreciation of Daumier’s pieces rose after his death, with the École des Beaux-Arts holding an exhibition of his works in 1901. 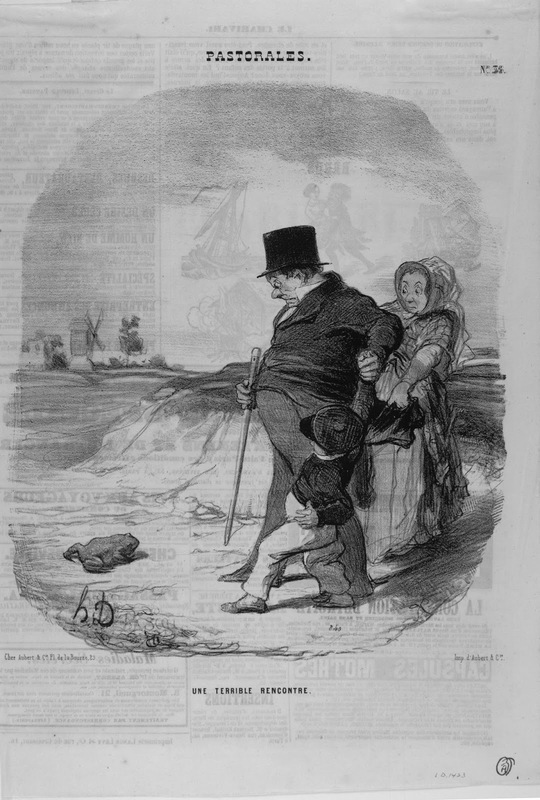 Today, Daumier has works in many prestigious museums, including the Louvre and the Metropolitan Museum of Art. Brandeis is proud to join these great museums in housing a fine collection of lithographs made by this acclaimed French artist. High-quality digital images of the entire Trustman Collection are available through the Brandeis Institutional Repository. 1. While the vast majority of these prints are from the large editions done on newsprint, there are also many fine examples printed on wove white paper (sur blanc). 2. Wikipedia. 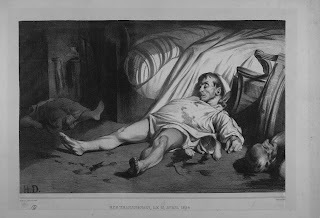 “Honoré Daumier.” Last modified September 12, 2015. 4. Arts and Culture 104. “Rue Transnonain, Daumier.” Friday, December 10, 2010. Description by Max Close, undergraduate student in History and Archives & Special Collections assistant.